Kickstarter is an innovative social startup that uses crowd sourcing to fund creative projects and ambitious endeavors. This startup is made up of a team of 14 in New York, New York with offices in the Lower East Side. Half of them work on the product (designing and coding), and the other half work with the community. Kickstarter sets itself apart from more traditional sources of project funding in many ways. Most of the process is paperless. Unlike traditional art grants, there is no formal application to be mailed or form to be filled out. The application is done fully online and the fundraising process can be tracked by anybody with Internet access. Kickstarter is powered by a unique all-or-nothing funding method where projects must be fully-funded or no money changes hands. Every Kickstarter project must be fully funded before its deadline or no money changes hands. This is done to minimize risk for both the artist and the people funding the project. If somebody needs $6,000, it’s tough having $3,000 and a bunch of people expecting you to complete a $6,000 project. Another reason behind the all-or-nothing funding method is that it allows people to test concepts (or conditionally sell stuff) without risk. If a project doesn’t receive the support it needs, then the project doesn’t get the green light. Another important difference of Kickstarter is that any project’s page already has the necessary tools to create buzz through social media. Projects can be shared through Twitter, Facebook, Tumblr, and email. 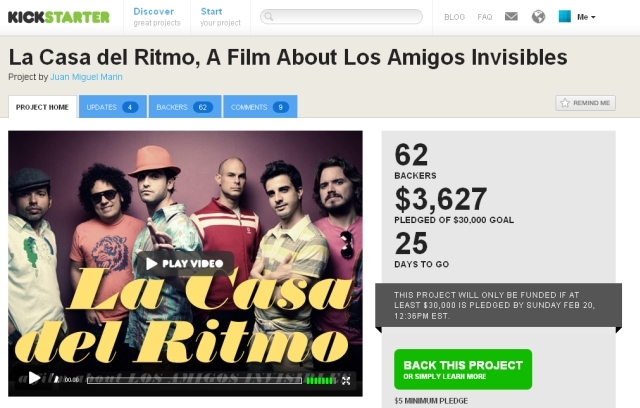 Of course you can also share a short URL that links directly to the project’s page on Kickstarter. 5. Forget the donor wall, get me some goodies! This another attractive feature for project creators. Try Kickstarter today and view examples of current indie projects. Article by Damian Davila, author of 4 Tips for a Successful Email Newsletter. Follow him at @idaconcpts. Hello, I am currently MSC. Entrepreneurship at Spears School of Business, OSU. I am interested in providing solution for digital learning in K-12 Math, Science, Engineering and Technology. How can I raise fund from Kickstarter?